November 1st was world project management day. Last year I wrote about project management being a life skill for all. This year I have been reflecting that many projects still fail and what ‘magic ingredient’ could improve this situation. There are many PM methods and I can provide credentials in several with my name in the PRINCE2 manual, involvement in Chartered Project Professional assessments, Agile coaching, PRAXIS trainer, PMI reviewer and supporting methods such as EVM. These provide PM skills but we still want and need to improve outcomes. At this year’s Project Challenge exhibition in London CUPE presented a session about using EVM in scientific research projects. We considered why we were able to successfully apply EVM in a resistant environment. It comes down to behaviour. Soft skills are often cited as required to ensure successful outcomes but these are wide ranging and often put down to the Project Manager’s personality. Something more useful is needed and we considered this further. We are facilitators as well as PPM specialists. We worked with the scientific PMs and facilitated sessions to be able to implement EVM. Project Managers are not known as soft and fluffy characters and I fit the mould but I do believe in ‘behavioural PM’. What I mean by this is that the PM’s behaviours affect how the team operates and delivers. I do not see changing PMs into everyone’s best friend to get others on board is either realistic or desirable. What I can see is that providing them with a skill to improve the effectiveness of meetings and help others work through issues to gain agreements will make a difference. The Process Iceberg method of Facilitation is an ideal vehicle for PMs as it is not fluffy and uses techniques and approaches which enable PMs to follow processes and feel comfortable, yet improve how their teams function and, as a result, their effectiveness. 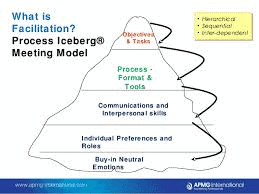 Process Iceberg is a process based approach to facilitation which sets out what should be done when and by whom. It demonstrates many techniques to choose from for different circumstances and groups and includes some insight to how individual behavioural preferences can be managed. There are 5 layers to the iceberg and you work up and down them all. Facilitation is recognised in many PM methods as necessary. Indeed, AgilePM works by the collaboration of the development team with the business who require the products. Facilitation is not included in the methods as it is a soft skill supporting the PM skills, neither do we see it on the list of courses in many organisations as part of a Project Management Academy or specialist PPM training companies. It is often assumed that the PM should develop these skills with experience. While this is true of some, most need some guidance. Am I proposing that all PMs are given facilitation training? No. This is not realistic but training some is a good idea and when applying the skills they have learnt they will influence the behaviour of others. This improvement in how groups work and gaining agreement on difficult issues is bound to improve outcomes. Does it mean that every project will deliver on time, to cost and provide a product which is accepted? Of course not. There are still other variables which will influence the outcomes of projects. Learning how to facilitate well is, however, one step in the journey to successful projects, although I believe it would be a significant one. CUPE has taught many PMs on facilitation courses who have all identified that it will be useful to the successful delivery of their projects and none have fed back that it is too soft. Join us on the next course being held December 3rd – 7th in Bournemouth. To find out more contact us on Team@cupeinternational.com or call +44 (0)1202 555711.